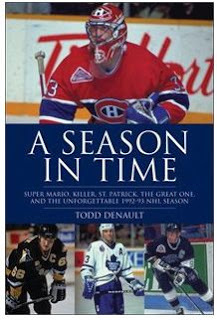 I recently had the great opportunity to interview with none other than Todd Denault, author of the bestselling book A Season In Time: Super Mario, Killer, St. Patrick, The Great One and the Unforgettable 1992-93 NHL Season. This is Todd Denault;s third book release. A Season in Time: Super Mario, Killer, St. Patrick, the Great One, and the Unforgettable 1992-93 NHL Season is a celebration of the twentieth anniversary of one of the greatest seasons in hockey history. And congratulations are in order, as the book as made Chapters' bestsellers list. Here's the full book review. What follows is the interview. I hope you enjoy it. There are a lot of great seasons in National Hockey League history. Why did you pick the 1992-93 season to relive? As someone whose childhood coincided with the 1980's, I now look back and feel extremely fortunate to have grown up in that era. To have watched the careers of Wayne Gretzky and Mario Lemieux in their entirety, watched Canada Cups, witnessed the Battles of Alberta and Quebec, and most of all to have lived through that whole high scoring time ... simply put, in my opinion, it was truly hockey's golden age. In retrospect, the 1992-93 season was the concluding year of that unforgettable era. The 24 NHL teams that season combined for a record 7,311 goals, 14 players cracked the 50 goal barrier, and 21 players reached the 100 point mark. As a means of comparison in the last season, 2011-12, the now 30 NHL teams combined for 6,545 goals, only 2 players scored 50 goals, and only one managed to tally 100 points. To me, at least, the game just seemed so much more exciting than it is today. Also, from a historical perspective, 1992-93 was the last season before the game went in a different direction, both on and off the ice. On the ice, the following season, 1993-94 witnessed the onset of the "Dead Puck Era," while off the ice we saw the stirrings of the current labour problems that continue to plague the sport to the present day. Beyond that, it was also a season that saw a lot of endings ... the spring of 1993 saw Wayne Gretzky play in his last Stanley Cup Final, the Montreal Canadiens win the - up until now - their last Stanley Cup, and by extension it was the last championship won by a Canadian based franchise. Add to that a memorable, record breaking regular season, followed by one of the most unpredictable and exciting playoffs in league history and I think that there's a story to be told. Lemieux's battle against cancer. Gretzky's near-Hollywood perfect ending. The emergence of Eric Lindros. The Leafs renaissance. The Canadiens capture Canada's last Stanley Cup. In your mind, what was the biggest story of the 1993 season? In many ways the answer to your question depends on your geographical standing. If you're from the Pittsburgh area, obviously Mario is the story of that year, whereas if you're from the province of Ontario then the Leafs are the story of that season, both then and now. Beyond that however, I personally think that when most people reflect back on that season, they immediately think of Montreal winning ten straight overtime games in the playoffs In hockey, there are a lot of unbreakable records, or significant achievements that will never be equalled. What the Canadiens did that spring, I think it's safe to say will never be repeated. Who was the best player of the 1992-93 season? Lemieux? Gretzky? Roy? Gilmour? Yzerman? Selanne? Part of what made 1992-93 so memorable was the sheer amount of significant players enjoying special seasons. As for the best player during that season, I don't think you can answer with anybody else's name other than Mario Lemieux. Now if you asked me which player was the most important to his team that year, than I would answer with Doug Gilmour. And when it comes to the playoffs you can't say anybody but Patrick Roy. Montreal won the Stanley Cup in 1993, the last Canadian team to do so. That is still a huge mark of pride in Montreal obviously, but can the same be said throughout the rest of Canada? I'm not sure if it's a mark of pride outside of Montreal but 1993 is a year that sticks out in the minds of hockey fans across Canada, because subsequently every time a Canadian based team has appeared in the Stanley Cup final we are constantly remembered that the 1992-93 Canadiens are the last such team to take home the ultimate prize. That they were that last team stands as an achievement that will remain important and relevant until some other team from Canada skates around holding the Stanley Cup aloft. How much did Montreal and Toronto's success play in making this "a great season?" Is it possible to have a great season with neither team heavily involved in the Stanley Cup race? I think the possibility of Montreal and Toronto playing in the Stanley Cup Final played a significant part in making the season a special one, and their dual success that spring definitely helped to make the season much more memorable, both at the time and in the two decades since. With that being said I think that it is possible to have a great season with neither team being heavily involved, but as history has shown it's much harder. What was the most underrated story of the 1992-93 season? Clearly, the surprising playoff success of the New York Islanders, a franchise that ironically has yet to win a playoff series since. What the Islanders accomplished that spring - including arguably the greatest playoff upset in recent Stanley Cup history - was completely unforeseen, especially after the incident involving Dale Hunter and Pierre Turgeon in the team's first round playoff conquest of the Washington Capitals. One could make the argument that the 1992-93 Islanders, and not the four Stanley Cup teams, represents Al Arbour's greatest coaching performance. As you retraced the season in your research, what storyline(s) did you find surprised you in retrospect more than you expected to? I guess I really wasn't aware of the various "conspiracy stories" that surround the Marty McSorley "illegal stick" incident. Of course, we all know the accepted version of events. But the perspective of some of the Kings players and surrounding staff was quite eye-opening and I thought it was critical to include that in the finished book. Were there shall I say neferious tactics afoot? Did the Canadiens perhaps gain an advantage by taking an advantage of a situation? Is the whole thing just sour grapes? I guess it depends what side of the fence you're sitting on. In your opinion, how did we go from the high flying 1980s and early 1990s to the Dead Puck Era of 1995 to 2005? Oh, and how I miss the days when a player would come charging down the wing, cross the blueline and unleash a slapshot from just below the red dot that beat the goaltender. I can't remember the last time I saw a player successfully pull that off. Book related question - What new hockey book released in 2012 are you looking forward to the most? There's definitely a lot to choose from but without question "Crossing the Line" by Derek Sanderson and Kevin Shea is at the very top of my list. The combination of Sanderson's unique story and the writing expertise of Shea, a person I consider one of Canada's finest hockey writers, is sure to give us all an entertaining, and informative read.